About 300 homes were evacuated as a fast-moving wildfire burned through some 3,300 acres (1,335 hectares) of parched land northwest of Los Angeles on Saturday, the County of Los Angeles Fire Department said. The so-called “Sand Fire” broke out on Friday afternoon and spread quickly near Santa Clarita, about 40 miles (65 km) northwest of the city. 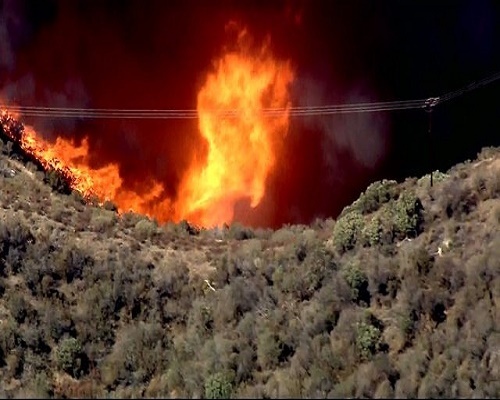 Some 300 firefighters were battling the wildfire that is zero percent contained. There has been one minor injury to a firefighter, and as of Saturday morning no structures were destroyed, the department said. No deaths have been reported. The fire is one of a series that have hit the drought-stricken state this summer, where dried grass and bush land as well as high temperatures in the region have helped fuel the blazes.